Have you long sought plumbing software to solve your business’ organizational and scheduling issues? Well, seek no further! Smart Service manages every aspect of the plumbing business. Marketing, sales, scheduling, dispatching, purchase orders, equipment tracking, routing, invoicing… it’s all right here in one plumbing software solution! Sayonara, double data entry! Smart Service is a seamless, intuitive QuickBooks add-on, meaning scheduling information entered in Smart Service is immediately duplicated within QuickBooks. Likewise, customers from your QuickBooks database can be imported into Smart Service. Say goodbye to wasted time and effort. Say hello to a more streamlined approach with an easy to use plumbing software solution. Give yourself a smarter way of doing business today! Learn more. Manage single-visit residential plumbing jobs as well as extensive construction-based installs with Smart Service’s intuitive service scheduler. This plumbing software will let you schedule and dispatch jobs in just a few clicks. Set your techs’ schedules and the corresponding jobs will be added to your customer entries in QuickBooks automatically. Learn more. It’s time to take your plumbing business mobile. Don’t waste another minute trying to decipher the illegible work orders your technicians bring back to the office. Replace their clipboards with our iFleet mobile app, the premier plumbing mobile app. With iFleet, your techs will be able to file and complete paperwork in the field. They’ll also be able to attach purchase orders to their jobs the moment of the sale! Don’t let parts go unbilled ever again. Learn more. With Smart Service, you get a plumbing software solution that scales and stays manageable as your company grows. Unlike other plumbing software packages, there are no monthly subscription or user fees with Smart Service. Manage your plumbing company with the peace of mind that comes with knowing Smart Service can be your #1 plumbing software solution both now and in the future. Learn more. Smart Service was recently featured in Plumber magazine! Find out what happened to Jim Dandy Sewer & Plumbing after they chose our plumbing software. Plumbing software is the software used by plumbing service companies and plumbing contractors to manage day-to-day operations of the business. These operations include scheduling, dispatch, invoice generation, digital work order creation, equipment tracking, and much more. Plumbing software can be used in the office on desktop computers and by plumbers out in the field on mobile devices. By going digital with your plumbing operations, you can effectively streamline most of your operations that directly impact customer service and productivity. With a comprehensive plumbing software solution, your office team can better communicate with plumbers out in the field about new jobs, work order updates, job locations, and more. With the plumbing mobile app, plumbers can see their schedule, navigate to new jobs, review customer information and history, update work orders in the field, and collect customer signatures electronically. Eliminate messy paperwork and wasted time with the Smart Service plumbing software and mobile app. Check out other impressive plumbing software features to see other ways Smart Service can benefit your company! How would my company move customer records to Smart Service? Integrating your existing customer records with Smart Service is easy! Because Smart Service plumbing software is a QuickBooks add-on, all of your customer data in QuickBooks is connected with Smart Service. When a work order is completed and closed out in Smart Service, a ready-to-bill invoice is generated right in QuickBooks. Save time and improve billing accuracy by eliminating the need for double data entry. Smart Service is compatible with QuickBooks® Pro, Premier, Enterprise, and Online. Can I use Smart Service plumbing software on a mobile device? We understand that your office team is only a part of the puzzle. That is why we developed iFleet, the Smart Service mobile field service app. Your plumbers will have instant access to their schedules, work order information, job navigation, digital forms, and more on their mobile devices. iFleet can be downloaded from the Google Play store or the Apple App Store. How do I purchase Smart Service for my business? If you are interested in learning more about Smart Service plumbing software, simply fill out our form for a free demo request or call us at 1-888-518-0818 to speak to one of our representatives. In our free demonstration, you will be able to see exactly how our plumbing software can streamline your business. If you have more questions, be sure to look through our complete FAQ page. If, after that, you still have questions, feel free to contact us and we will be more than happy to help you! The best plumbing software on the market, Smart Service runs plumbing businesses with aplomb. Discover why you need plumbing software and some of the best features of plumbing software. 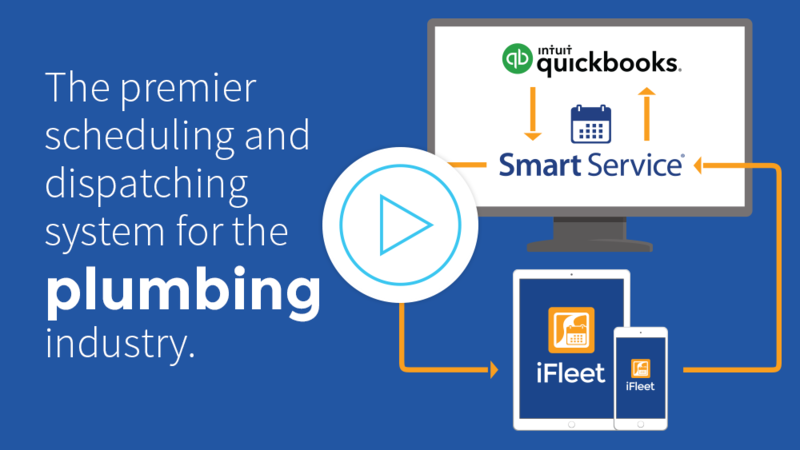 Then take a look at the ways Smart Service integrates with QuickBooks to tackle dispatching, scheduling, and everything else plumbing. Place your plumbing business above the competition!